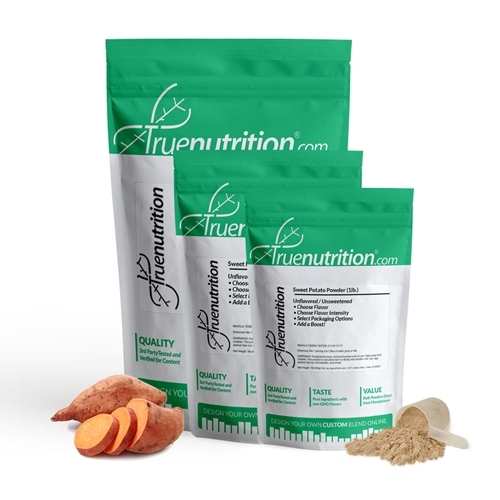 True Nutrition's Sweet Potato Powder offers a wholefoods carbohydrate source that is both nutritious and delicious! Sweet Potato Powder is one of a very few select carbohydrate sources that are considered to be Paleo-friendly, making this our go-to source for many of our Paleo protein and meal replacement options online. Derived from dehydrated sweet potatoes that are then pulverized into a functional wholefoods powder and harvested in Peru! Uses: Supports Increased Energy: Provides 26g of carbohydrates to help support increased energy! Mix-ability: Shake or stir rigorously for best results. Some settling may occur. Taste: Strong, earthy taste with a slight mouthfeel and texture. Goes better with chocolate, vanilla, peanut butter, or caramel flavors. Mix 1 Serving (About 1 Scoop) in 8-12floz of water, juice, or milk. Shake or stir and enjoy!